“Photographic superimposition is useful when the remains are likely to belong to a particular missing person, and photographs are available. Generally, this technique is best used for exclusion, but a positive identification is possible if the morphological features are unique.” (A. H. Ross, 2004). The present investigation is based on aspects of Ross’ observations of both the value as well as the limitations of photographic superimposition. Our analysis is also supported by other forensic investigations based on photographic and imaging technology (Ubelaker, 2000; Ubelaker et. al., 1992; Matsui, 2001). Our analysis differs in one important aspect. Where identification is typically based on the superimposition of skeletal remains (a skull or skull fragment) onto a life photograph, our investigation superimposes the photograph of a cadaver onto the life photographs of two potential candidates whose identity as the cadaver is in dispute. There are commonalities, however, between the present analysis and those of the past. First, our case is limited to two specific candidates – one of whom can be excluded, and secondly, our comparison relies on the observation of unique morphological features. In the spring of 2005 Professor Mimi Wesson approached the senior investigator (DVG) with a story and a question. The story was this. 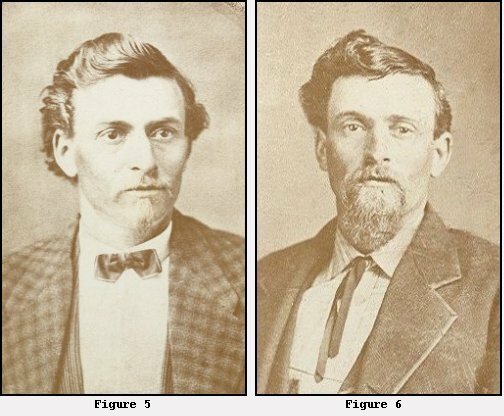 A man reputed to be John Hillmon was shot to death at Crooked Creek campground near Medicine Lodge, Kansas, March 17th, 1879. 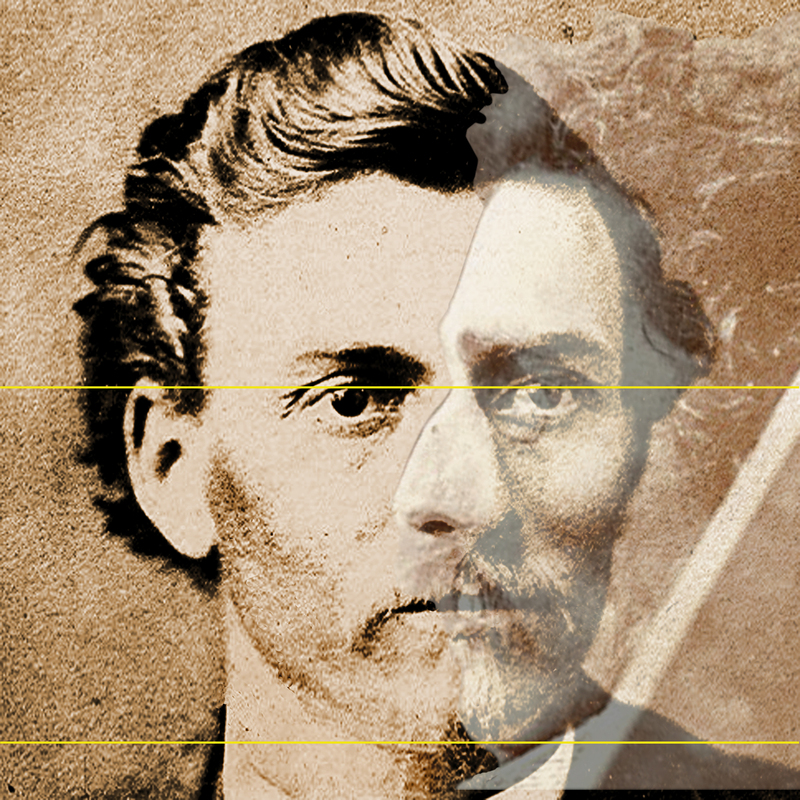 According to the initial report the shooting resulted accidentally when his traveling companion, a man named John Brown, was removing a loaded rifle from their wagon. Brown reported the accident immediately and a coroner’s jury supported Mr. Brown’s story. Soon, however, the identity of the corpse became the focus of debate. As it turns out, two insurance companies had insured Hillmon’s life, and they disputed his widow’s claim. They responded that another person was shot at the campsite and substituted for Hillmon in an effort to swindle them out of the proceeds. In pursuit of their investigation the companies had the body exhumed from its grave in Medicine Lodge and brought to Lawrence. The body was photographed and various individuals, including Hillmon’s wife, were brought to the corpse for identification. Some confirmed the identification as Hillmon while others disputed it. Sallie Hillmon filed a lawsuit against the companies in 1882. In the course of their investigation agents for the companies identified a candidate for the substitute – a man by the name of Frederick Adolph Walters. Thus the debate began. 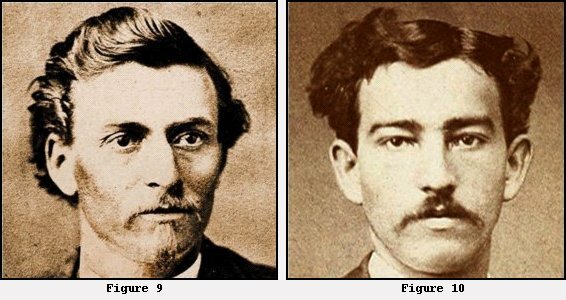 Was the corpse now buried at Oak Hill Cemetery in Lawrence, Kansas, that of John Hillmon, the victim of a tragic accident? Or was the corpse that of Alfred Adolph Walters – a victim duped, shot, and substituted for Hillmon? The debate would rage for 25 years. There would be six trials, and two referrals to the Supreme Court. And while Sallie Hillmon’s claim was ultimately settled, it was never determined with certainty who was buried in the grave at Oak Hill Cemetery. Was it John Hillmon or Frederick Adolph Walters? This was the story my friend Mimi told me during our first meeting in the spring of 2005. In the course of her investigation she had discovered six photographs two of the corpse, and two each of John Hillmon and Frederick Walters. As I examined them, she posed the question. Could we discover, once and for all, who died at the Crooked Creek campground? I was hooked and our quest began. The case began for me with the photographs (Figures 1-6). They are standard for the period. 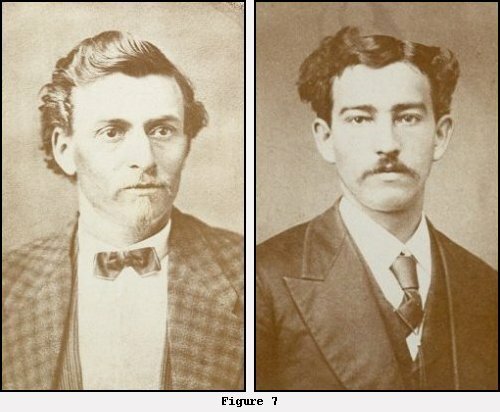 One distinctive feature of the corpse as well as Hillmon and Walters struck me immediately – the shape of the bridge of their noses – particularly the bony bridge of their noses. The bridge of Hillmon’s nose is “hooked” with a strong curvature and a deep saddle between the eyes. The bridge of Walters nose, on the other hand, is far straighter with no particular curvature and no depression between the eyes. The difference is particularly clear when Walters and Hillmon are compared side-by-side (Figure 7). This kind of difference is important to any hope of an identification because it involves body structure with little in the way of overlying soft tissue. 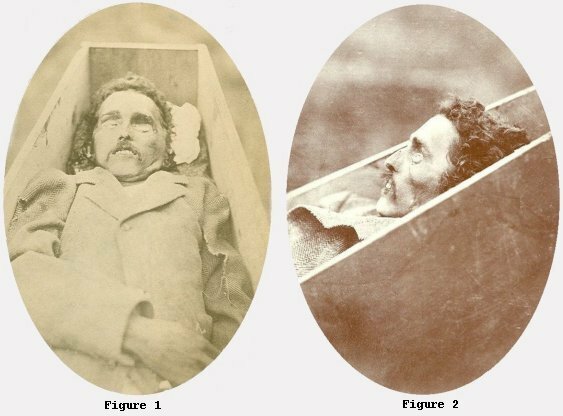 The feature was particularly intriguing when the life photos are compared to the corpse. The profile view of the corpse (Figure 2)) appears to show a strongly arched nose with a deep depression or saddle. Given the likelihood that the remains in Oak Hill Cemetery are one of two candidates combined with at least one striking and bony anatomical feature (bridge of the nose) an exhumation of the remains with the goal of photographic superimposition seemed the best approach. An application to the Court in Lawrence was subsequently filed and permission to exhume the remains was granted in 2006.Exhumation began at 7:00 am May 18th, 2006. The grave was unmarked on the eastern slope of the cemetery some 75 feet from the apex of the hill. The slope was approximately 25 degrees. The grave was oriented east-west with the head to the west.Excavation began with the removal of approximately 2 feet of grave surface using a backhoe provided by Mitch Young, manager of the cemetery. Following removal of the grave surface, the remainder of the grave was excavated using hand tools. At a depth of approximately 50 inches a natural spring was encountered making further excavation with tools impossible.Continued exploration of the grave preceded by hand-probing the spring and surrounding silt deposit. 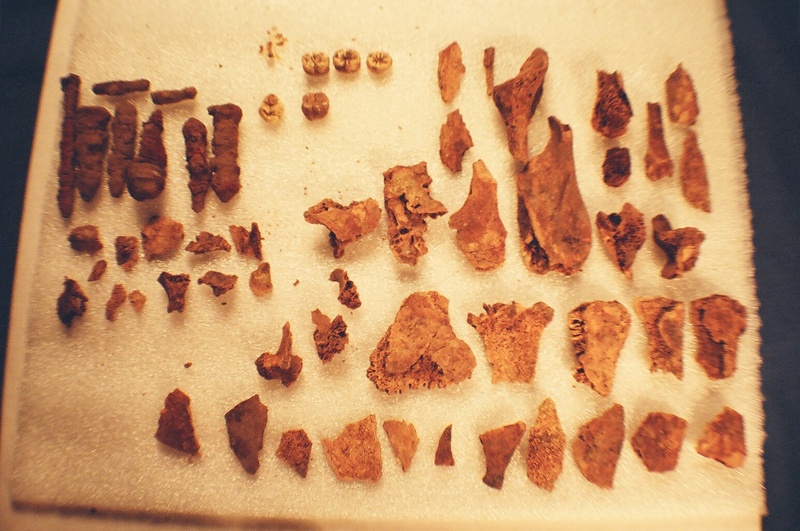 The first bone fragment was discovered approximately 2 feet from the west end and 12 inches from the north side of the grave in approximately 6 inches of water. The fragment was that of the left scapula preserving the posterior half of the glenoid process (4 cms.) and 3 cms.) of the inferior margin of the scapular body. Subsequent probing produced numerous fragments of skull including the right ascending ramus of the mandible and five tooth crowns. Fragments of the posterior skeleton were also recovered. In all some 28 identifiable bone fragments and the crowns of 5 molar teeth were recovered. In addition, 8 coffin nails and one shirt button were removed with the remains (Figure 8). The remains are consistent with those of a single adult individual. The presence of wear facets of all molars suggests that the teeth were in occlusion for at five years. Wear on M1 with slight dentin exposure on the protoconid would suggest an age range between 25 and 40 years. It was clear, however, that the kind of identification envisioned at the outset of the project was impossible.An alternative approach, however, had emerged. In the course of a genealogical search for living descendants of both Walters and Hillmon (required by the Court) a grandson of Adolph Walters brother was identified. Mr. Dan Davis agreed to provide a DNA sample. A grandson of John Hillmon’s half brother also came forward (Leray Hillmon) and provided a DNA sample. Given the potential for a positive identification based on DNA, a small sample of bone was returned to Boulder for genetic analysis. The DNA analysis has been a resounding failure. Over a century of submersion has washed all traces of human DNA from the bone. Such DNA as has been found has turned out again and again to be bacterial contamination. With the possibility of either a skeletal or genetic analysis gone, only one solution remained – the old photographs. While far from ideal, they contain more information that was originally realized. We decided to employ the same Adobe Photoshop software used in the superimposition of cranial remains on life photographs (Ross, 2004) to the superimposition of the life photos of Hillmon and Walters on the corpse. This required a number of steps. 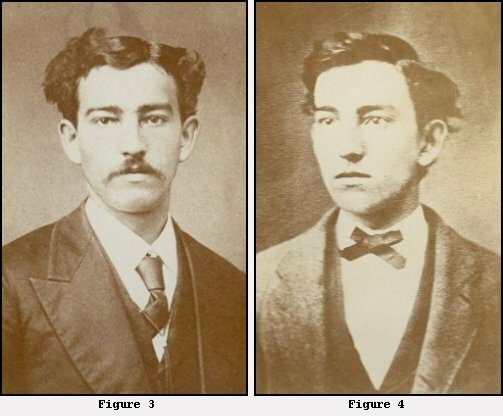 First images of Hillmon and Walters were selected to provide the clearest view of the nasal profile (Figures 9 and 10). 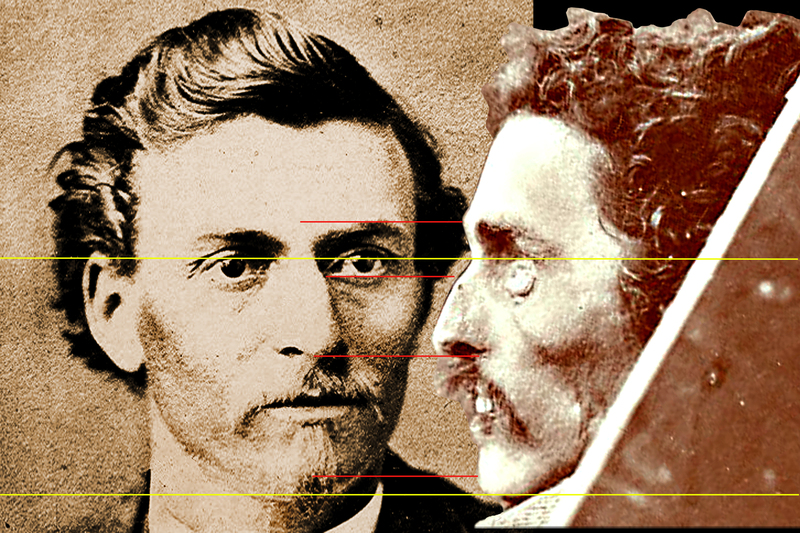 The profile image of the corpse was then digitally rotated into a vertical axis matching the life photographs (Figure 11). The corpse and life photos were then matched to two standard anatomical points in order to control for differences in scale. The points (indicated by yellow lines) are gnathion (the lower margin of the chin) and nasion (a point at the top of the nasal bones between the eyes). 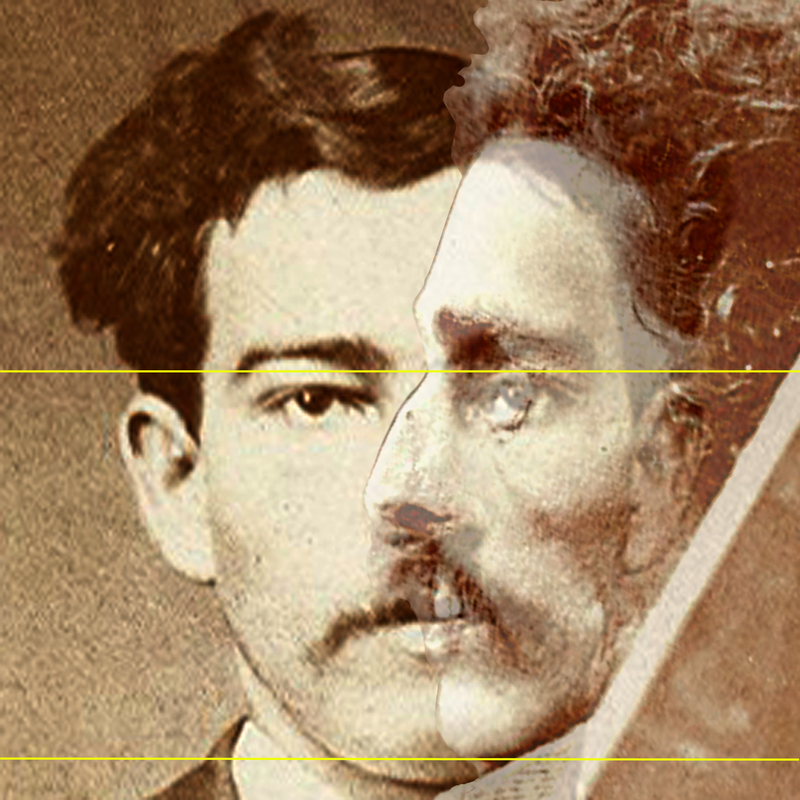 The match between for life photo of Hillmon and the corpse is striking when the images are superimposed (Figure 12). The nasal profile of the two is a virtual mirror image. In addition, other features such as the hairline, position of the eyebrow, base of the nose, and lips also match precisely. This is illustrated further by a side-by-side comparison (Figure 13). In contrast, Walters and the corpse are substantially less similar. Once again, scaled to match at nasion and mention, the nasal profile and the base of the nose are substantially different (Figure 14). The points of difference are clarified in a side-by-side comparison (Figure 15). The red lines indicate the anatomical projection while the blue indicate the most likely anatomical position of the actual landmark. Given the two candidates, the match to Hillmon is clearly the most compelling and indeed, we conclude that of the two, Walters can be excluded. This comparison is not ideal, and certainly would not be advocated in place of a skeletal or genetic approach. Obviously, none of the photographs were produced under controlled conditions, and certain assumptions had to be made. Nevertheless some things could be controlled. For example, expanding the images proportionately to match at nasion and gnathion effectively controlled for scale. The corpse profile was also rotated into an anatomically correct upright position based on a vertical alignment of the forehead and chin. The vertical (upright) orientation of the life photos, on the other hand, had to be assumed. While this assumption appears reasonable based on the visual evidence, some slight divergence of the images toward or away from the plain of view (caused by the subject leaning backward or forward or inclining the head at the time of the photo) is likely. The result would be some degree of distortion of all comparisons in the vertical plain. Also, the anatomical points chosen for comparison were not equally apparent on the life photos. 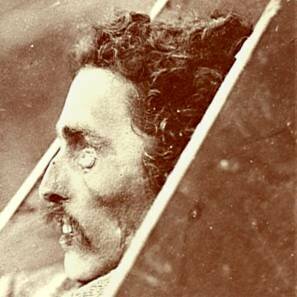 Due to the striking architecture of their nasal profiles, nasion is clearly identifiable on the Hillmon photo as well as on that of the corpse. This landmark is less apparent on the Walters image. Identifying the position of nathion was complicated by a slight skin fold beneath both Walters’ and Hillmon’s chins. Gnation is readily apparent on the corpse image. 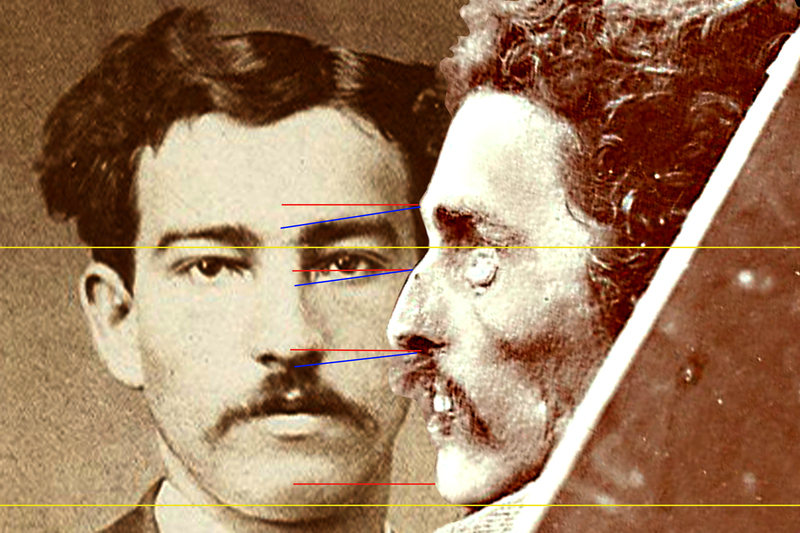 Photographic superimposition is useful when the remains are likely to belong to a particular missing person, … a positive identification is possible if the morphological features are unique. (Moss. 2004). In the present case the corpse is likely to be one of two persons one of whom, like the corpse, possesses a striking if not unique morphological feature. This leads us to conclude, we feel to a reasonable professional certainty, that the corpse interred in Oak Hill Cemetery was that of John Hillmon. Matsui, K. Digital imaging in forensic medicine. In: Digital Color Imaging in Biomedicine. ID Corporation, Tokyo, 2001, pp. 73-76. Ross, A.H. Use of Digital Imaging in the Identification of Fragmentary Human Skeletal Remains: A Case from the Republic of Panama. Forensic Science Communications [Online]. (October 2004). Ubelaker, D.H. History of Smithsonian-FBI collaboration in forensic anthropology, especially in regard to facial imagery, Forensic Science Communications [Online]. (October 2000). Ubelaker, D.H., Bubniak, E., and O’Donnell, G.E. Computer-assisted photographic superimposition, Journal of Forensic Sciences (1992) 37(3):750-762.